As the Intergovernmental Panel on Climate Change meets on measures to reduce the impact of climate change, the answer to the global problem remains clear: The world must stop betting on a dirty fossil fuel energy system and should instead double-down on investment in clean, sustainable renewable energy. While no easy task, the good news is that the shift is already beginning. In a report released today, WWF details how action is being taken to promote renewable energy in countries around the world. The report -- Decarbonizing the Future: Seizing Power for Global Change -- demonstrates the solutions for reducing global greenhouse gas emissions and holding global temperature increases below 2°C. In India, a national action plan will result in up to 20 billion watts of grid-based solar power coming online by 2022 – accounting for close to 10% of India’s total installed power generation capacity. In China, where wind power is already generating more electricity than nuclear, Decarbonizing the Future shows how proven renewable energy technology could support over 80% of the country’s growing power demand toward 2050. In Norway, the world’s largest sovereign wealth fund is evaluating the climate change impact of its coal, oil & gas investments. In Mexico, a national program details specific sectors and cross-sector activities for each ministry in the public administration, including clean energy infrastructure and forest conservation. In South Africa, where per capita emissions are higher than in China and India, WWF is working to help the old carbon economy become more efficient and productive using green economy strategies and building completely new sectors through low carbon technologies, infrastructure and systems. “The clear message from the IPCC is that climate change is a massive risk that the world isn’t doing enough to tackle. Changing the world’s energy sector is central to the task of confronting that risk. We can’t continue to gamble with the future of the world we depend on,” said Dr Stephan Singer, Director of Global Energy Policy for WWF. With renewable energy such a safe bet, why keep bluffing our way through taking real action on climate change? As Decarbonizing the Future shows, action on climate change is accessible, achievable and is already being taken. WWF’s Seize Your Power campaign calls on financial institutions to significantly increase their funding of renewable energy and cut funding to fossil fuels as a key means of tackling climate change. In the past year the World Bank, European Investment Bank and the European Bank for Reconstruction and Development have all committed to virtually end coal investments. 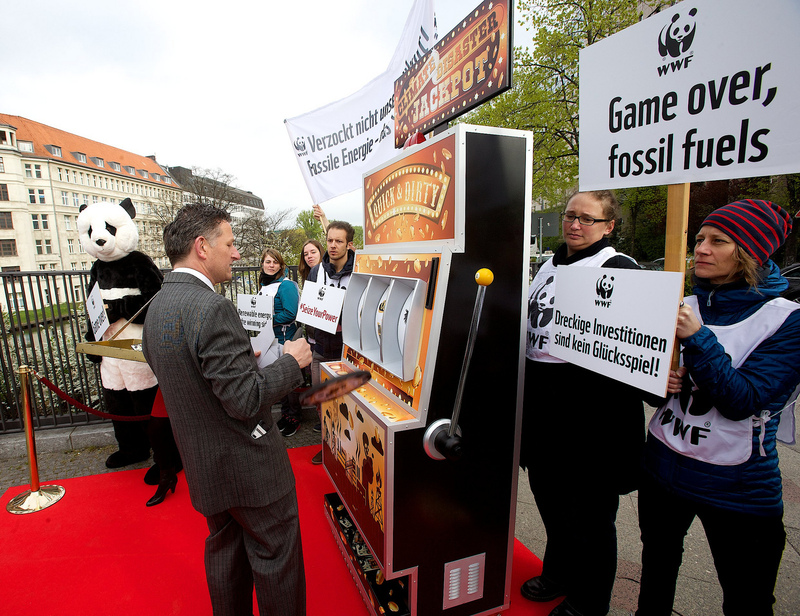 WWF highlighted the risk associated with betting on fossil fuels by setting up a mock casino outside the Estrel Convention Centre in Berlin, Germany where the IPCC is currently meeting.